Ever thought that Subzis could be made without using oil? Well Zero oil cooking is a skill, which was mastered as we assembled recipes for this section. You too can master it through practice and patience. 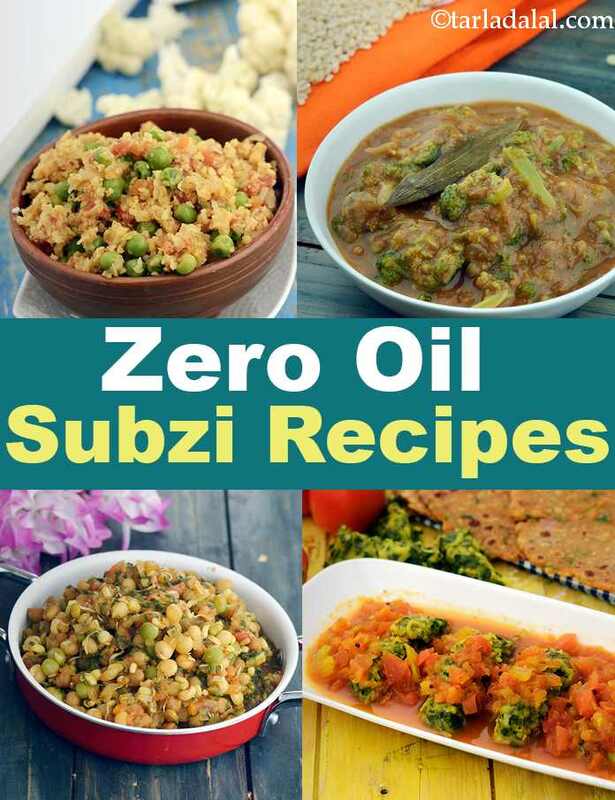 With a well-chosen collection of delicious recipes, we are sure this section will change the pre-conceived notion about having to essentially add oodles of oil to make Indian subzis tasty and to help you make your family’s meal times healthier and happier. Oil free subzis are excellent choice for weight watchers as they are low in calories and fat. Moreover we have used a combination of vegetables, sprouts and pulses to add on to the nutritive value. Are Oil Free Subzis good for Diabetics with High Cholesterol? Zero Oil Subzis are good for those diabetics who are trying to lose weight or those people who have high cholesterol levels because we have replaced some high fat items like cream, whole milk, cashewnut or coconut paste with vegetable paste, low fat milk and low fat paneer. People with diabetes should always consult their nutritionist or doctor before changing their diet. · Bhindi masala is one recipe which is not only oil free but also will boost your brain health. Being rich in folate it is a very good option for pregnant ladies as the folate requirements increase during pregnancy. · Rajma Saagwala is a nutritious oil free recipe as it is rich in Vitamin A to maintain good eye health. Being rich in calcium it will promote bone strength and is also rich in folic acid to revitalize your brain cells. · Tameta Muthia nu Shaak is a tangy zero oil recipe where the muthias are steamed and a perfect mix of spices gives it a brilliant flavour. It is a recipe rich in B-vitamin – Thiamine which is required for energy production and brain health. Other oil free versions of your favourite subzis from different states of India are Bharvan Baingan, Chole, Kofta Makhani, Shahi Paneer Mutter. Along with those are also a few exceptional ones like Mushroom and Green Peas Curry , Vaal Dalimbi and Cauliflower Indad. True to the name, "subzi pasanda" is a veggie dish you will love! calorie-laden cashewnut paste is replaced with a healthy paste made with cauliflower and onions. Serve hot with whole wheat parathas for a healthy meal. Though slightly time-consuming, this subzi is definitely worth the effort. Capsicum is a good source of vitamin C, an antioxidant that fights disease-causing free radicals and boosts our immune system while corn increases the allure of this dish manifold! Carrot, a storehouse of vitamin A, combines beautifully with French beans in this simple subzi. Peanuts are used in minor quantities to not only add crunch but also vitamin B3 to this subzi, making it delectable and nutritious.